I eagerly delved into Naomi Novik's standalone fantasy, having heard rave reports of her Temeraire series for years, but for some reason having not read them. It's often easier for me to dive into a standalone with a new author than it is a series it seems. The blurbs from luminaries such as Tamora Pierce and Maggie Stiefvater (and the comparisons to my beloved Robin McKinley) did not hurt things one bit. And the opening chapter is absolute perfection. I knew I was in for something special right off the bat. And, having finished Uprooted, I stand by my feelings that it is something special and absolutely worth your time and money investment, even if my overall impression came off not quite as glowing and awed as I might have hoped. It's worth taking a moment to admire that beautiful cover. My, how I love it. And the UK edition is glorious in a very different way. Lucky book, to be so beautifully packaged on both sides of the pond. And so opens Agnieszka's story. Hers is a Slavic-feeling fairy tale worthy of any Grimm wordsmith. The land and history are utterly developed and weighty with the years of folk tales, villagers, royalty, and political machinations that have shaped it into the place Agnieszka calls home. When she is chosen to apprentice to the legendary Dragon in place of her beautiful and fierce friend Kasia, she immediately fills with every fear every village girl has felt since the selection began. Her time in the ageless wizard's castle is a brutal education and the two get off to the rockiest of starts. His disdain for her plainness and disinterest in his lofty spells fairly drips from the page, mucking up Agnieszka's every waking moment. But when her uncanny ability with more organic magic comes into its own, their partnership begins to take on a more even and compelling nature. Of course, the aforementioned political and monarchical machinations come into play before they can really get off the ground, and the truly terrifying forest surrounding them begins to threaten the lives of every member of the kingdom. 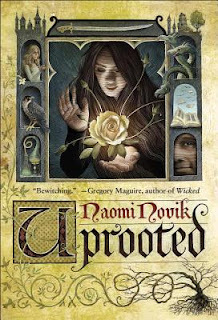 There is almost nothing not to love about Uprooted. From its implacable protagonist to the hearty elements of horror embodied by the terrifying denizens of the Wood, the elements of Novik's fairy tale are woven together with love, care, and a meticulous attention to what makes up a riveting tale. To say nothing of the utterly brilliant homage to Robin McKinley's work itself in the form of the legendary Luthe's Summoning spell, which no one has successfully cast in fifty years. Be still my heart, people. That alone is worth the price of admission. My only quibble is that I felt a small but persistent lack of attachment to the main characters. Make no mistake, I was incredibly fond of them from the start. The Dragon himself reminded me in no small way of Diana Wynne Jones' Howl, which I know will endear him to countless readers. And the comparisons to McKinley and Marillier are there without a doubt. My heart ached with loss on a number of occasions, as Novik clearly understands the price that must be paid when playing with magic and hubris on such a grand scale. However. Unlike McKinley's and Marillier's characters, I struggled a bit to hang on to Agnieszka and the Dragon. I admired them, smiled at them, and worried about them. But I can't say I loved them. They didn't become a part of me the way so many of my favorite characters do. I'm not sure if the fault is with me (since mine may well be the only dissenting voice on this aspect of the book), but while I loved the experience of reading it and have gained a wonderful appreciation for Ms. Novik's skill as a storyteller, I can tell it will not make my regular rotation of rereads, which is possibly more a reflection of my particular taste these days (perhaps more pages with Agnieszka and the Dragon actually within at least five miles of each other would have ameliorated this feeling of emotional distance) and not in any way an indictment of the book itself, which is a thing of beautiful craftsmanship. Dear Author - "The set-up and the slow realization by Agnieszka of just what she was made for compelling reading." The Book Smugglers - "The brilliant, beauteous, dark, and enchanting new fairy tale from Naomi Novik." Ivy Book Bindings - " It's beautifully written, scripted to perfection, and unique in the sense that it reads like lore." Fantasy Cafe - "This stand alone fantasy is one of the most compelling books I’ve read in a long time!" My Friends are Fiction - "I loved the writing, story and I had legit swoons though I’d hoped for a tiny bit more development for the relationship."